A relationship under fire. A fight for survival. Can their love weather the storm? Damien and Mia’s relationship deepens, but powerful forces threaten to destroy their newfound love. When Damien’s wealthy parents learn of his relationship with Mia, they’ll stop at nothing to rip her out of his life—and his heart. When Damien’s mother unleashes her worst, Mia finds herself on the verge of losing the future she’s fought to build. Can Mia and Damien stop his mother’s vindictive quest to ruin Mia’s life? Or will her money and power destroy Mia and tear the young lovers apart? 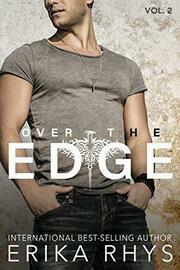 Over the Edge is a steamy new adult romance series. Vol. 2 is the second and final part of this two-volume series, which is also available as a boxed set. Read Over the Edge, vol. 2 to continue Damien and Mia’s story today!